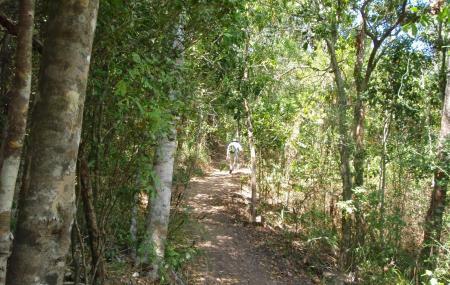 A 28km trail stretching through Conway State Forest from Brandy Creek Road to Airlie Beach, the Whitsunday Great Walk is designed as a 3-day hiking tour through the Australian rainforest. It has been opened up for mountain bikes as well. There are two campsites along the way and toilet facilities. Sections of the walk can be entered from Airlie Beach along the main track and done in a few hours. The walk takes you up Mount Hayward and Jubilee Pocket lookout points for some spectacular views. This offbeat adventure is an ideal way to be close to nature with 2000 year-old trees, season creeks, plenty of endemic flora and fauna. The walk is demanding and steep in parts and recommended for experienced hikers as it requires a certain level of fitness in order to complete. Tips & Warnings: There are four water tanks along the track, but it's important to treat the water before drinking it. You must take all rubbish away with you. Camping permits are requited and fees apply. The path is remote so carry a first aid kit and know how to use it. Carry ample food and water and keep it well stored. The track is closed during the wet season from February to March. Sunscreen and insect repellent are a must. Bus Stop on Brandy Creek Road. How popular is Whitsunday Great Walk? People normally club together Cedar Creek Falls and Big 4 Adventure Whitsunday Resort while planning their visit to Whitsunday Great Walk. People also prefer to end their day with Whitsunday Great Walk.